How do I reward myself for working so hard to get ready for Pesach? Every year, I treat myself to weekly sushi, my favorite food, and I spend at least a little time every night reading something I enjoy. 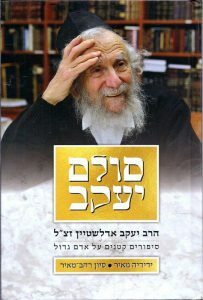 The book I’ve been reading this pre-Passover is the newly-released bestseller, “Jacob’s Ladder: Rabbi Yaakov Edelstein zt”l, Little Stories about a Great Man” (Hebrew) written by husband and wife team (and close students of Rabbi Edelstein) Yedidya and Sivan (Rahav) Meir. 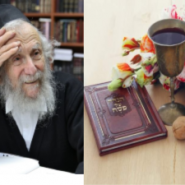 “My father worked very hard to awaken the curiosity of everyone at his seder. “When we got to “Yachatz,” he would make a whole ceremony out of breaking the matzah. The kids would eagerly watch the performance as their grandfather would pretend to struggle with great difficulty to break the matzah. When he finally succeeded in breaking it, all the grandchildren would cry out with joy. “And when he ate the maror, he would jump up, right out of his seat, as if from the maror’s bitterness. “And when we got to the 10 plagues, every year he would turn to one of his grandchildren and ask: “Tell me, if an Egyptian would take a cup of water from an Israelite and start to drink, what would he see in his cup? Blood!” And he would emphasize the word “blood,” his voice filled with horror. And he would continue, with similar drama, to describe the plague of frogs, and the rest of the plagues. “When we got to the 4 sons, he would theatrically present the wise son, the wicked son, the innocent son, and the son who doesn’t know how to ask, and really brought them alive so we felt that those 4 sons were sitting right there at the table with us. For a limited time, this book (which, I’m sorry, is not yet available in English) is being sold at a special discount at this link. Enter coupon code 1000 for a special discount and free delivery in Israel to the pickup point closest to your home. Every day until seder (4 days to go!) I will be posting a “Meaning-in-the-Cleaning Minute”: a minute-long video or short word of inspiration that made ME smile as I get ready this year for Pesach.